The Other Side - "My Friend Jay"
My friend Jeanie wrote her own version. You can check it out here. I met Jeanie when I moved to Grande Prairie in 2008 although it feels like I’ve known her much longer (in a good way.) We both accepted jobs at Forbes; my 4th year of teaching and Jeanie’s first. Somewhere in that year, we bonded over teaching, books, movies, drinks, food, and pretty much anything and everything else. Three quarters of the way through that year at Forbes, I came to Jeanie after Joe and I were presented with the idea of moving overseas and she, of course, was a huge support. Jeanie has travelled extensively – all over Europe, Thailand, Cuba, USA, etc – and she didn’t hesitate to pack up her life every once in awhile for a new experience. So, at the end of the year, I took off to Houston, she took off to Thailand for the summer and then returned for her second year of teaching. As you know, our road to the expat life wasn’t short and after spending several months in Houston, I returned to Grande Prairie and picked up a temporary teaching position while we awaited our destination. In the meantime, Jeanie had come across an opportunity to teach at a Canadian international school in Singapore. She asked what I thought and I responded with the same enthusiasm she gave me the year before. I like to think that I helped her secure the position with a bit of assistance in her resume but really it was her passion and dedication to teaching that is obvious when you meet her. We laughed as Joe and I had several locations fall through and here was Jeanie, starting a year later than us and she already new where and when she was going. In the end, Joe and I left Grande Prairie about 2 weeks before Jeanie did off to different continents and surely, different experiences. Jeanie took off to the ultra modern, ultra clean Singapore and Joe and I landed in third world Africa. We kept up with each others’ blogs and skyped a few times and reveled at the differences in our experience moving overseas. Here Jeanie was battling the Singapore transit system and I was faced with Africa and all of its frustrations. Jeanie had to overcome a bit more homesickness than I did but she also got to do a lot more traveling – Hong Kong, Cambodia, Thailand, Australia, China and Japan just in the past year. A few weeks ago, Joe let me know that he put in a request to complete a course in Singapore. I didn’t even budge as he’s done this numerous times throughout the year (albeit, not in Singapore but other locations throughout the world) and nothing was ever approved. His boss was holding out hoping he could arrange the course in West Africa. Imagine my surprise and excitement when it was APPROVED! Immediately, I began daydreaming of catching up with Jeanie. Shopping, eating, drinking coffees and being able to see first-hand what a move to Asia looks like! In a little under 2 weeks, Joe and I should be jetting off to Singapore. Jeanie, I can’t wait to be reunited! See you soon! Water is just one of those things you take for granted when living in a fully developed country. You turn on the taps and it’s always there and sometimes, you even grumble when the town puts restrictions on water use and you can’t water your lawn every night. It’s certainly not the same here. On the absolute best day, the water pressure is so low that it’s hard to take a shower. For that reason, the majority of expats have a large reservoir tank (ours is 1000 litres) and a pump. The tank fills up with the regular town water and then the pump takes over to force more water with more pressure into the house. The water gets shut off regularly here but sometimes you hardly notice as you use the water from the tank and then it gets turned back on again and the tank fills. Unfortunately this week, we've noticed it! The water has been shut off EVERY day for several hours at a time. The first time, all of our tank water was used as our guard graciously washed our cars (ahhh!!! I would have preferred flushing toilets than a clean car but whatever.) After that, it was impossible to catch up. The water would be turned on again for a couple of hours but the pressure was so low that it couldn’t make it up the pipes to our tank. When the water does return, we use it sparingly and wonder when it will stop again until it seems to come back for good. Life in the third world - always interesting! There really aren’t a lot of clothing stores here in Gabon. The few that we have are expensive and usually last years (or even 5,10,15 years before) style. In the markets, the majority of the clothes sold are second hand but around every corner is a fabric store and behind those corners are tailors, often Senegalese men. Walls, stacks and more walls of bright, heavily patterned fabric. 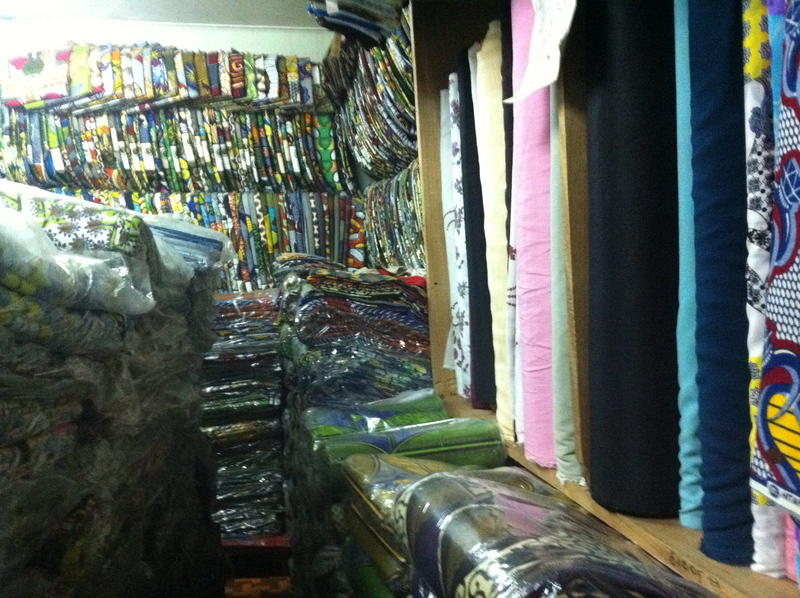 The tailors make a wide variety of African fashions and it’s generally quite cheap. You can get your custom dress made anywhere from around 10 000 cfa ($20) up depending on how elaborate it is. You can also take in something you already own and they’ll try to make a replica. 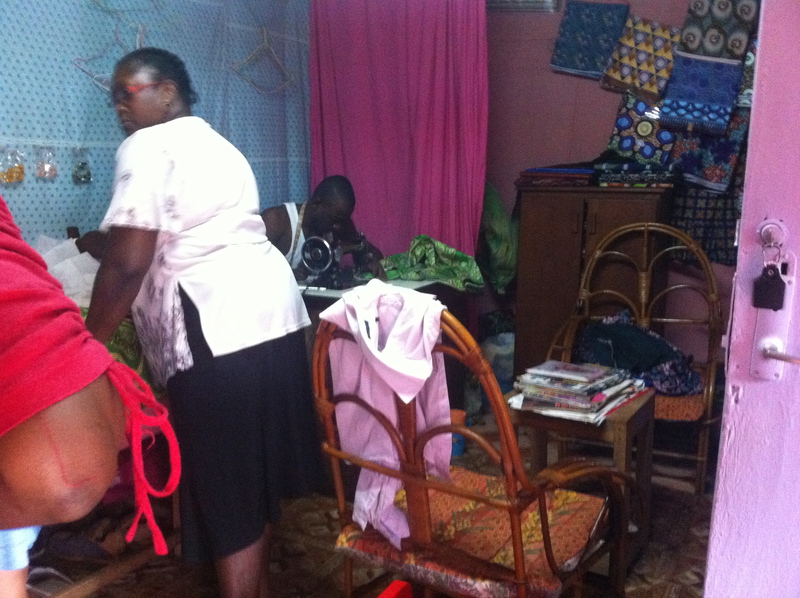 A terrible, unartistic photo of the tailor many of the women use. The dressing room is behind the pink curtain. Not exactly Saks but it gets the job done. Gabon’s Independence Day is August 17 and this year, they celebrated 51 years of independence from France. Obviously, the 17th is a nation-wide holiday each year just like Canada Day for us but there is one key difference; each year the government decides how many days everyone will have off in addition to the 17th. This year it was announced we would have the 15, 16, 17 & 18 for celebrations. The government only announces this immediately before the holiday is to commence so this year we heard rumblings Friday evening and it was confirmed Saturday morning at the police station when they told us they were closed until the following Friday. (Yes, even the police station closes!) This makes it virtually impossible to organize any sort of travel plans, which is sort of annoying. Joe could have taken today off and we’d have 9 days of travel time. Instead, we stayed in Port Gentil. It is also a little annoying not knowing in advance that all of the stores are going to be closed for the week. This made doing all of those little jobs around the new apartment difficult, as we weren’t able to get any supplies. Luckily, the supermarket opened for limited hours throughout the week so we weren’t forced to starve! The President of Gabon arrived in Port Gentil Saturday afternoon and as far as I know, this was his first trip to our city since we’ve lived here. He has a giant palace downtown only a couple of blocks from our new place that sits vacant all year long. Many of the roads were closed and guarded by the army and police for the afternoon so that he’d have a clear route. I’m not sure how long he stayed but not long enough for the festivities on the 17th. All in all, we enjoyed our relaxing week and Joe trudged off to work again this morning for one more day before the weekend! 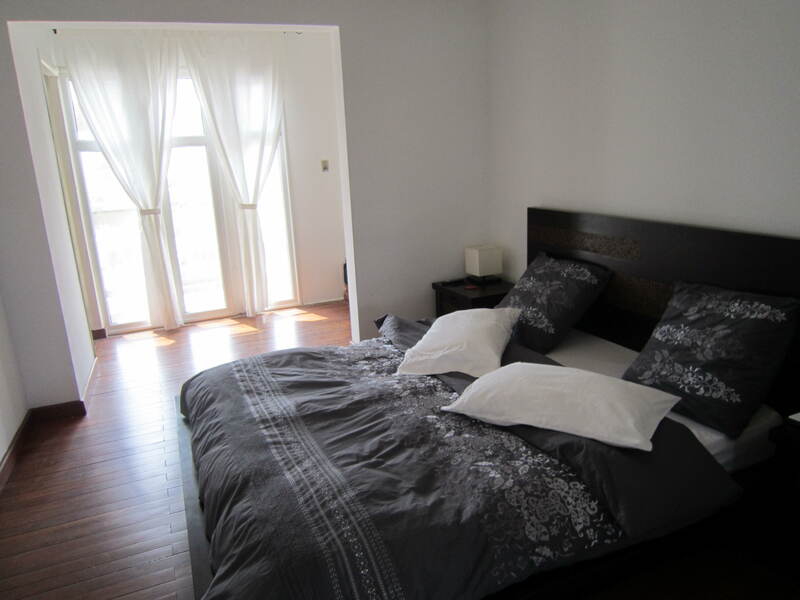 Our new bedroom: nice, light and airy! The Conclusion – To Menagere or Not? Christiana came highly recommended. She worked with my friends for the entirety of their stay in Gabon and was reliable and trustworthy and the timing was perfect – our friends left in July and we arrived in August ready for our new apartment. Currently, she is set to work Monday through Friday from 8:00 am to 3:00 pm for a salary of 150 000 per month ($300.) Obviously, we don’t need someone that often so many days I’ll send her home at lunch but we wanted to make sure that we didn’t give her too slack a schedule because then it might be hard to change afterwards. When we need something done at the house (a plumber, electrician, A/C maintenance, etc.) I don’t have to sit around waiting all day wondering when they are going to show up because Christiana is here. She is great at ironing so even my sheets get pressed. I’ve been getting a ton of practice speaking in French and she corrects me and teaches me new words all of the time. So far, so good and fingers crossed that it continues on this path! I received a piece of mail yesterday and it sparked a frustration that has been burrowing inside me (and Joe) and I'd love to get it off my chest. Africa is a continent and it is HUGE! It is the second largest continent with the second largest population (behind Asia.) It has 54 countries - 54, that's a lot - and it's home to over 1 BILLION people. South Africa is 1 out of 54 countries on the continent of Africa. So when I say I live in Africa, it does not mean I live in South Africa. (You would be surprised how often we get that response!) Should be fairly simple however, even some major organisations have had troubles with this concept. RBC - you should be ashamed. did the exact same thing on mail addressed to Joe. Ahhh - I feel much better. Thank you for indulging me. Joe & I just finished our final bits of shopping before we fly back to Gabon tomorrow. 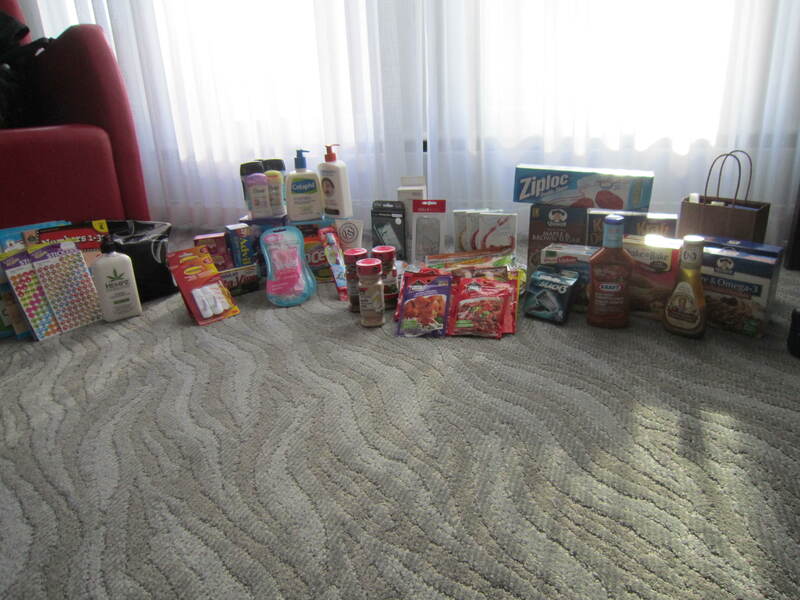 Below is what we bought over the last couple of days because either we can't get it in Gabon or it's so expensive it's better to bring it over ourselves. Keep in mind, this does not include all of the curtains we bought for our new apartment, new clothes, wedding gifts (hard drives full of movies & TV shows thanks to Kellen, Jessica & Mike B,) Joe's diabetic supplies & prescriptions for the year, kitchen utensils (bbq lighter, tongs, meat tenderizer,) and anything else we may have picked up earlier on in the trip. I have a feeling we're going to be a touch overweight this time!